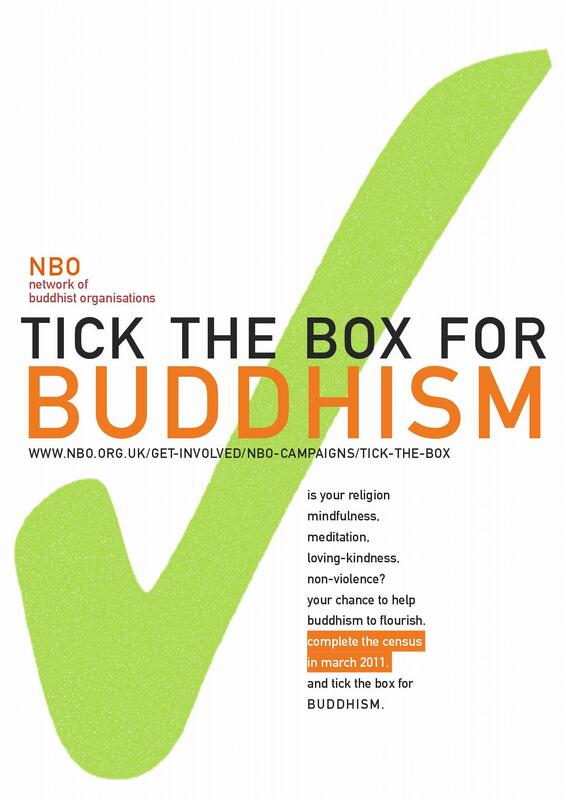 Please join our campaign ‘Tick the Box for Buddhism’. You can print off our campaign poster to display in your organisation or forward to friends here (or as separate sides – side 1 and side 2). There’s a sample piece for your newsletter here and a general introduction to the campaign here. What’s it all about? The next census, in March 2011, will include a voluntary question about religious affiliation. This was controversial in the last census in 2001 because many felt that it was an invasion of privacy and that the information might be abused. Several hundred thousand Jedi Knights demonstrated their opposition by coming out as a new religion. Those worried about how the religious affiliation figures might be used were right to be concerned. They have been used to determine relative levels of representation, access, and funding made available through government, charities and public organisations to faith groups. Levels of recognitions have been adjusted according to the relative proportion of the ‘vote’ a faith received on the census. Based upon the last census figures the lion’s share of influence has been taken by the large and established religions. The choices available only list the six official major faiths – Buddhist, Christian, Hindu, Muslim, Jewish and Sikh faiths, (and ‘none’ and ‘other’) – and they do not distinguish between cultural, lukewarm and serious religious practitioners. The question favours cultural affiliation to religion (the feeling that one has the same religion as one’s parents or ethnic group even if one does not practice) rather than those who actively practice a faith. Secondly, evidence suggests that many who are sympathetic to Buddhism, and who may practice mindfulness and meditation, or who are inspired by or respect its teachings, did not indicate that they were Buddhists on the 2001 census. Western Buddhists in particular are uncomfortable with adopting labels, or with feeling forced to express a religious identity. Because of these problems with the census question on religious affiiliation, we would prefer that it was not included and that other more precise and frequent surveys were used to determine how religion influences British citizens. However, since the question is to remain to guide government policy for the next ten years then many of us would like to see more accurate figures for Buddhism. Buddhism brings a moderating and common-sense influence to religious issues which is sorely needed. And it is the only non-theistic faith ( one which does not worry about ‘God’) amongst the major faiths. Based upon the levels of interest shown in Buddhist practices, mindfulness, retreats, information and books, we think it is reasonable to anticipate that up to half a million citizens could ‘tick the box’ for Buddhism in the next census if they realised the importance of doing this. If this were the case we would expect Buddhism and its values to be more visible and to exert more influence. And perhaps most importantly, greater support for Buddhism would demonstrate public demand for religiously inspired behaviour that UK citizens admire and want to encourage – behaviour based on compassion, generosity, tolerance, non-violence, humility, rational discourse, and proven meditation and spiritual teachings. With greater support for Buddhism we would also expect that mindfulness and other meditation practices which are proving very helpful for general well-being, would be more widely taught in schools and that the religious curricula might give more emphasis to the human values and behaviour that we share in common and admire – compassion, kindness, generosity, wisdom and meditation and rational inquiry – rather than religious doctrine that tends to be divisive. So, if you have been inspired by, or benefited from, Buddhism through meditation, mindfulness practice, or attendance at a Buddhist group or retreat, please indicate your support by ticking the Buddhist box on the 2011 census. And we want to encourage all Buddhists to ask their friends, in Buddhist temples, monasteries and mindfulness centres, and other sympathetic groups, and in internet social networking sites and forums, to do the same. In addition to these problems with the religious question, there was also a low return rate at the last census from Asian and other ethnic groups in the UK. We encourage all Buddhists from an Asian background to make sure they complete the Census. The census figures will be used to allocate budgets for health, education, transport and social welfare to local neighbourhoods. If census forms are not returned for an area then insufficient services will be provided. Given the way the census figures for religion will be used we think it better to see the question as asking ‘What faith do you most support?’ and to see this as your opportunity to vote. When is the Census? How do I fill it in? The Census is held once every ten years. In the UK you will be sent Census forms in March 2011 for completion ideally on 27th March. Everyone should complete the Census, since Government policy and funding allocation is greatly influenced by the data. Census returns are anonymous for 100 years and the data is not passed on to tax or immigration or other government departments, so it is safe to complete the Census. I am not sure if I qualify as a Buddhist. I do meditate and respect its teachings but was christened as a child. If you practice Buddhism in any way: through meditation, mindfulness practice, or chanting, or enjoy Buddhist books and teachings, then it is perfectly appropriate to tick the Buddhist box. Many of those who tick the boxes for the other faiths do not practice at all, but simply fall in line with family tradition or habit. So you may actually be more genuine in your choice of Buddhism than many of those who ticked boxes for other faiths. I don’t think that Buddhism is a religion – it is a philosophy or way of life – shouldn’t I just refuse to answer it at all? Well, you at liberty to do this. However, even though there has always been a debate about just what a religion is, and Buddhism does not have a creator god, it is recognised as one of the six major religions in the UK. This gives it an important moderating influence on the overall religious climate of the UK. We strongly encourage all who admire, respect and practice Buddhism to tick the Buddhism box. I don’t agree with this question being on the Census. It is an invasion of privacy. Should I refuse to answer? Well, see the previous answer. But if you do refuse to answer, your vote will be used as part of those who indicate they are irreligious. And you will lose this last opportunity to promote Buddhism. This will be a great loss, especially as this is likely to be the last Census and the figures may be used to guide policy for at least ten years. I wrote in ‘Jedi’ last time- should I do this again? You are of course at liberty to do this. There are also other unusual religions being publicised. We understand that many people do this as a form of protest at being asked about their beliefs. However, if you genuinely have no respect for any faith, then we would advise you to tick the ‘No Religion’ box, especially as a ‘Jedi’ or any other unusual new religion would be counted as ‘No Religion’ anyway. However, we find that many who did tick ‘Jedi’ at the last Census, do in fact practice Buddhist meditation or some other aspect of Buddhism. If this is the case for you, then we would strongly advise you to tick ‘Buddhism’. Remember, it is only the six main faiths that are recognised, and increasing support for Buddhism is a very effective protest against traditional religions and the way they behave. Someone else in my household may fill in the form for me – how do I make sure my choice of Buddhism is recorded for me? One person fills in part of the census form which relates to the whole household. However, there is also a part of the form that can be filled in by each member of the household which only refers to your information. The question on religion is on this part of the form so you can fill in this part yourself or ask the person filling in the rest of the form to fill in your information correctly. Can I tick a different box to the one I ticked in 2001? Yes! Whatever answer you gave in 2001, you can still tick ‘Buddhism’ in 2011.